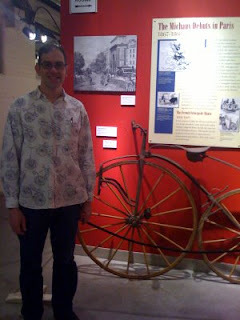 Last night Lauren and I went to the opening of the "The Wheelmen's Machine - The Bicycle and Its Innovators" at the Charles River Museum of Industry and Innovation. Nice exhibit with lots of bikes and info from the real early days of penny farthings and velocipedes. So not my primary interest (I really only get excited around 1960...), but still pretty good. Lots of food and drinks, and we met lots of Wednesday Wheelers from the Charles River Wheelmen. The rest of the museum was actually more interesting - it's set in the old Waltham Watch factory and there are lots of exhibits about watchmaking, and a few giant clocks with the works exposed. As planned, I drove up to Great Brook Farm State Park this morning around 8, and spent a lovely 2 hours or so shoeing around. It was my longest jaunt on snow shoes yet, and I must say it was a great success! I parked at the main lot for the Great Brook Ski Touring Center and ventured straight out onto the Lantern Loop. I must admit that, while I've wanted to try this for months, it's never been clear to me whether or not it's allowed to go out on the ski trails with snow shoes. Signs explicitly say that there's "no hiking" - but I wasn't hiking, I was snow shoeing! In any case, the weather was a bit nippy at 5-7 degrees during my time out there, but I managed to keep warm thanks to lots of layering. The ski trails were very well groomed, with smooth ruts on the sides, where the skiiers apparently go... I was informed of this fact by the first skiiers of the day I ran across, once I'd moved on to the Maple Ridge trail. They were none too pleased that I was tromping all over them, and they also let me know that I wasn't supposed to be on those trails at all. After I made it back to the parking lot sheepishly, I discovered that the ski center had opened, so I went in to find out the deal. They were very helpful, informing me that the trails on the other side of Lowell St are open to all. They also rent skis, shoes, and pulks (child sleds to pull behind - click to download a great book about these). I was actually a bit knackered at that point, but I wanted to see what I was missing on the other side of the road, so I ventured across and did the Acorn Trail and Acorn North. These trails were not groomed at all, narrower, and a bit more challenging than the ones I'd done earlier. The bad news is that in that 30 mins or so, I probably covered a third of the multi-use trails offered by the park. If I'd stuck to the allowed trails all morning, I could have done the lot without too much trouble. Still, it was a beautiful morning! Also made me start thinking about taking up XC skiing again. More pics in this Facebook gallery.